Neanderthal groups occupied the Abric Romaní Q level (Capellades, Barcelona) over 60,000 years and left there important demonstrations of their daily activities. This is showed by the remains found during the excavation that IPHES (Catalan Institute of Human Paleoecology and Social Evolution) has developed since August 8th. This field campaign was the 35th at the site and was directed by Dr Eudald Carbonell, Dr Palmira Saladié and Dr Gema Chacón. These years in the Q level, on an area of 250 square meters, more than 12,000 archaeological remains have been found including fauna and stone tools, and more than thirty hearths. .
“We have excavated the remains of a human occupation about 60,000 years ago”, points out Dr Palmira Saladié, “It was probably a campsite used by Neanderthals”. 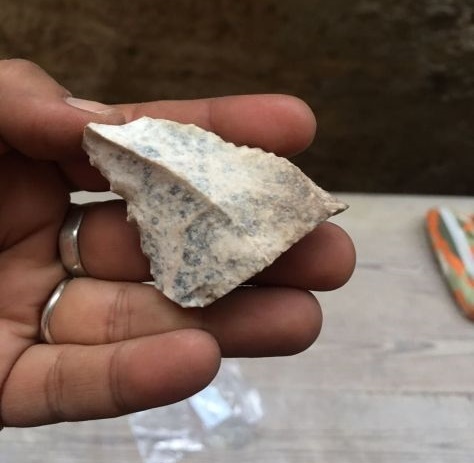 The count of the archaeological remains yielded in this season, as well as the vestiges found in the last two years during investigation in level Q, is of about 5,000 stone tools and 7,000 faunal remains. Stone tools were produced in different materials such as flint, quartz and limestone. “This year many artefacts related to different domestic activities carried out by the Neanderthals in the campsite have been identified,” comments Dr Gema Chacón.”The fauna recovered results from Neanderthal hunting tactics regarding its subsistence and is made up of bones of horses, deer and goats”, says Dr Palmira Saladié. Abric Romaní is a site that stands out due to the presence of well-preserved hearths throughout its sequence. “More than 30 hearths have been excavated this season. They will allow us to reconstruct the domestic space of the Neanderthal group that lived here”, says Dr Gema Chacón. The inner part of the rockshelter located close to the wall was used as a sleeping area as showed by many small fireplaces. In the central part of the site we found large domestic areas were Neanderthals developed different activities, such as the tools production and food cooking. Finally, the external part of the campsite was used as waste dump. There abundant fauna, stone tools and charcoals remains have been recovered. The excavation of these domestic spaces presents excellent conditions of preservation. “In the coming years it will allow us to carry out studies on the technology, the hunting, the social organisation and, finally be able to understand the lifestyle of these human groups of Middle Palaeolithic”, says Dr Palmira Saladié. The scientific aim of researches at Abric Romaní site is the palaeoethnographic reconstruction, from a social perspective, of the Middle Palaeolithic hunter societies. During next year’s campaign the next layer R will be excavated. It is expected to be dated at approximately 62,000 years old. The excavations at Abric Romaní are part of the research project under the name Abric Romani – Cinglera de Capelló archaeologial site funded by the Department of Culture of Generalitat de Catalunya.